Make sure the low-dose lithium supplement you take passed our quality review and is right for you! Very low doses of lithium are being used to treat mood and other psychological conditions, and even to prevent dementia -- including Alzheimer's disease. Many low-dose lithium supplements have come on the market to meet this need. But how good is the quality of these supplements? Do they really contain what they claim? Which are best? And how solid is the research behind the use of these products? To answer these questions, ConsumerLab.com recently purchased popular brands of lithium supplements providing 0.05 to 20 mg of lithium (from lithium orotate, lithium aspartate, and lithium chloride). It then tested these supplements for their amounts of lithium and potential contamination with toxic heavy metals (lead, cadmium, and arsenic), and also checked if tablets would properly release their ingredients. 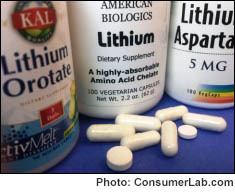 ConsumerLab's experts also reviewed the scientific literature behind the use of low-dose lithium. You must be a ConsumerLab.com member to get the full test results along with ConsumerLab.com's findings, recommendations, and quality ratings. You'll get results for ten lithium supplements -- nine selected by ConsumerLab.com and one which passed testing in our voluntary Quality Certification Program.